Hey, i’m newbie too and I’m sorry to interrupt. You asked Tony what he sees. Well what I see is the chart on October and August 2015 and it is maybe indicates that this could be the bottom of the drop. Just an idea for me at least and of course the fact that this the 1.30 line which could be a very strong support line. I have a buy order on 1.2970. Well the pair is in the support area looking at the daily and weekly also there is allot of traffic there , and the volume is starting to deplete as well. We are now at the middle of the week and this is when allot of traders make their best trades. I see what dredd37 is seeing . guys wonder what your thoughts are on this pair? ive noticed on the daily EUR/USD that it has broken the trend line (green dashes). The orange line shows the support bar it bounced off. Would you have entered the trade? Where would you have put the stop? I put the stop on the orange line for the previous resistance, or would you have stopped on the red line above two days previous candles? the volume is starting to deplete as well. 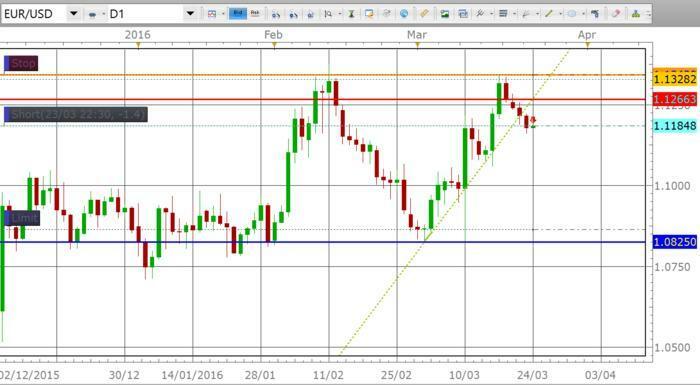 We are now at the middle of the week and this is when allot of traders make their best trades. Well there are always more than one way to trade a pair, it all depends on what you want…I am going to wait until Europe market opens , then i will see if i’ll take a short on E/U. Now right now the yellow line from the current position is about 130 pips or so, that is really the proper place to put the S/L but i would take a risk and put the stop on the red line which is less than 100 pips. I don’t want to lower my pip value per trade. Either way there is a good potential for a good amount of pips to be made. When i place an order to buy , if i am buy the computer and it gets near my buy order and it starts to move away and all the indicators are right, i will pull the trigger. I then place a tight S/L just in case i am wrong, remember nothing is 100 % in any type of trading. Thanks Shaneharpe16, indeed I’d like to turn to EURGBP now. I’m waiting for the close of the daily candle now because I see a huge opportunity for sell. Look at the level where is it now. The last time when it was that high was in December 2014. Very promising sell signal I would say. Found this thread at the weekend and have since read about 70 pages. Very interesting so far and seems to be a simple approach to making money. Started a 5000GBP demo account and looking forward to making it grow before making some real money. First two trades were (very small) winners which I traded out of too quickly - lesson learned. Although a winners a winner I guess. Seems to be lots of potential trades out there at the moment, just waiting for the right signal to get a trade in. Glad to see a well-spoken newcomer arriving. This thread you posted on is probably the most valuable to a Price Action trader. Myself, I am still working on trying to be profitable after about 5+ years of studying Forex. At the moment, my problem seems to be not picking any specific trading strategy and not knowing what type of trader I am. After so long you would think I would have figured this out… I honestly haven’t. My problem seems to be that I don’t know if I can trade longer time frames such as the Daily and 4-hour (my two favorite time frames) or be more of a scalper on smaller time frames like the 10-minute. The person that introduced me to Forex makes an average of $16,000 a day only taking small trades of about 10 pips at a time (Each pip equaling about $450) and he’s been trying to teach me his strategy. It’s been going over my head so far. Anyways, yeah that’s my dilemma, and it looks like you’ve figured things out quite nicely. That’s very important! Main attraction with this type of style is it seems I can fit it in around my day job. Your friend sounds very talented, I bet he also has time to look at the charts all day? I don’t have that luxury I’m afraid and so that would put me off that style of trading at the moment. That and I think its harder on smaller timeframes? Anyways took a trade on GPB USD last night, with the DAILY DOWN trend, price action pin bar on 4HR and daily chart and its turned against me. My mistake I guess is not looking at the closest resistance to the left and looking at the second closest if that makes sense. Also the 4 HR is in uptrend? Any comments? Still has time to turn around I guess. DOnt worry. I took the same trade this morning. Lovely pinbar formed and closed on the daily. at 09:30 the second candle was bearish and heading down. Now it has turned into indecision. Will be patient I feel that the pound will continue down in the short term. Its been a while since I last posted on this thread . Here goes my Price Action trade of the day ! I took the same trade GBP/ USD short all we need to be is patient.